'Restraint' Appears To Be Over As North Korea Launches Missile Test Again : The Two-Way The firing of three short-range missiles was believed to be the first test since the North launched a milestone intercontinental ballistic missile test last month. A South Korean soldier at the Seoul Train Station watches footage of North Korea's missile launch on Saturday. The missiles did not pose a threat to North America nor to the U.S. territory of Guam, said the Pacific Command. But the distance of 150 miles was far enough to reach major South Korean and American military bases, reports The New York Times. 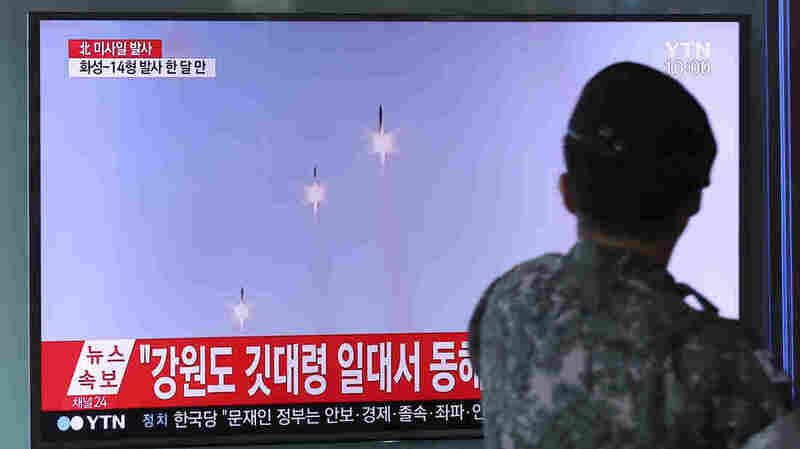 The test "shows an advance in capability," says The Times because the "missiles were 300-millimeter rockets fired from a multiple-tube launcher." The launches are believed to be North Korea's first test since the Fourth of July when it fired its first intercontinental ballistic test into the sea near Japan. The White House said President Trump was briefed on what happened and "we are monitoring the situation." Earlier this month Trump had warned that North Korea would be met with "fire and fury," if it continued with its threats. Hours later North Korea had said it was "carefully examining" plans to strike Guam. But earlier this week the rhetoric appeared to be cooling — at least on the American side — as Trump expressed optimism about North Korea on Tuesday, saying of leader Kim Jong Un, "I respect the fact that he is starting to respect us." Also on Tuesday, Secretary of State Rex Tillerson praised Pyongyang for demonstrating "some level of restraint," noting that there had been "no missile launches or provocative acts on the part of North Korea," since the United Nations Security Council voted Aug. 5 to impose a $1 billion sanctions package against the country. "We hope that this is the beginning of this signal that we've been looking for — that they are ready to restrain their level of tensions, they're ready to restrain their provocative acts and that perhaps we are seeing our pathway to sometime in the near future having some dialogue," Tillerson said. North Korea's latest test comes at the same time as U.S. and South Korean forces participate in joint military exercises on the Korean Peninsula. NPR's Elise Hu reports from Seoul that the U.S. maintains the computer-based drills are purely defensive, but the North has long regarded them as preparations for invasion. Seoul said the war games will continue "even more thoroughly" in response to the launch, reports The Associated Press.